XKCD often makes us think; the strip’s forays into science and social policy often rank near the top of my personal list of salient and clear educational devices on tough issues. Here’s a timeline of Earth’s average atmospheric temperature, going back a few years before your mother was born (though she was born a long, long time ago!). See where this is headed? No one else has done it much better. I did wonder when I saw this earlier, on September 12: Did the creator of XKCD learn this stuff in Edward Tufte’s course? Most serious birdwatchers can tell you about global warming and climate change, just from watching the birds at their feeders, and when those birds migrate. Scientists have shown for the first time that common bird populations are responding to climate change in a similar pronounced way in both Europe and the USA. An international team of researchers led by Durham University, UK, found that populations of bird species expected to do well due to climate change had substantially outperformed those expected to do badly over a 30 year period from 1980 to 2010. The research, conducted in collaboration with the RSPB and the United States Geological Survey (USGS), is published in the journal Science. It is the first real demonstration that climate is having a similar, large-scale influence on the abundance of common birds in widely separated parts of the world, the researchers said. 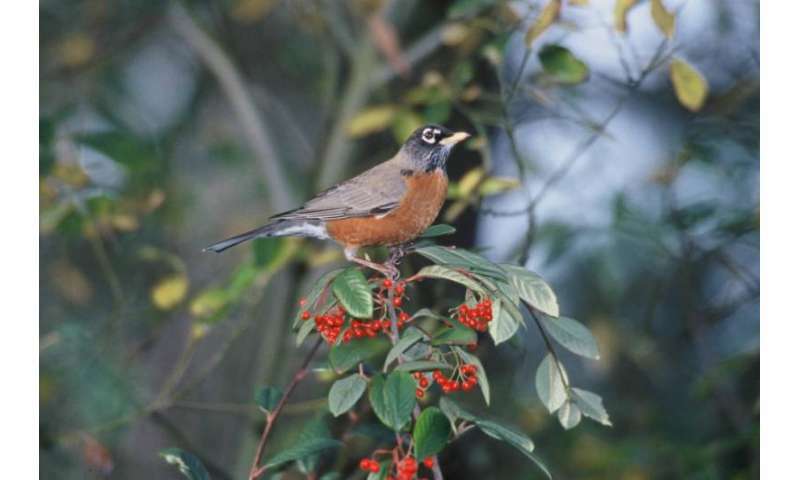 Among the species showing pronounced effects of climate change are common woodland and garden birds such as the wren, in Europe, and the American robin in the USA. Biologists especially work to predict effects of warming on plants and animals, both to help plan changes in activities such as farming and hunting, and to protect species that are endangered now, or are likely to become so due to changing climate factors. This study shows scientists can predict with accuracy some of the wildlife effects. These changes are consistent with changing climate suitability within those areas, the researchers said. Other factors, such as the size of the birds, the habitats they live in and their migratory behaviour, all affect bird populations, but did not differ systematically between groups advantaged or disadvantaged by climate change. Therefore, only climate change could explain the differences between average population trends in advantaged and disadvantaged groups, the researchers said. The study’s lead authors, Dr Stephen Willis and Dr Philip Stephens, of Durham University’s School of Biological and Biomedical Sciences, said the findings showed there was a large-scale, consistent response by bird populations to climate change on two continents. Generally it would be an insult to call someone a bird brain. We may need to revise that thinking. In contrast to climate change denialists, 177 species of migratory birds in North America have adjusted their migrations because of a warming climate. The birds know something the denialists don’t. The news comes from the National Audubon Society, after analysis of 40 years of bird count data. Migrations has the story, along with the map that is appearing in U.S. newspapers this week. Cornell University’s ornithology blog, Round Robin, provides history to the study and a couple more links to science reports. How will denialists spin this? It’s difficult for them to claim that the birds have been hornswoggled by inaccurate newspaper accounts, since these are not the birds whose cages are lined with newspapers. We don’t have a canary in a mine warning us, this time. It’s the meadowlark on the prairie. Will we listen, in time? Eastern and Western Meadowlark: These popular robin-sized grassland birds form winter flocks and always feed on the ground. Neither species has been wintering farther north over the past 40 years, probably because the quality of northern grasslands is not sufficient to support these birds through the winter. The Eastern Meadowlark is one of Audubon’s Common Birds in Decline; its population has plummeted 72% in population over the last 40 years. You are currently browsing the archives for the Annals of Global Warming category.